7:30 p.m. Wednesday, Feb. 13 - Men's Basketball vs. Boise State. Staff and Faculty Appreciation Day. Complimentary tickets for Fresno State staff and faculty with additional tickets available at a discount. Players' favorite teachers honored at halftime. College spotlight: Science and Math. Fun in-game giveaways like Me-N-Ed's pizza toss and Chevron T-shirt toss. 5 p.m. Friday, Feb. 15 - Women's Tennis vs. BYU. 6 p.m. Friday, Feb. 15 - Baseball vs Utah Valley. Opening Night. Youth Jersey Friday where all kids (12 years and younger) get in FREE if wearing a jersey. Exclusive “Our Valley” in-game T-shirt toss. 2 p.m. Saturday, Feb. 16 - Women's Basketball vs. New Mexico. Breast Cancer Awareness Night. Wear PINK and get in FREE! 6 p.m. Saturday, Feb. 16 - Baseball vs. Utah Valley. 1 p.m. Sunday, Feb. 17 - Baseball vs. Utah Valley. Social Media Madness. 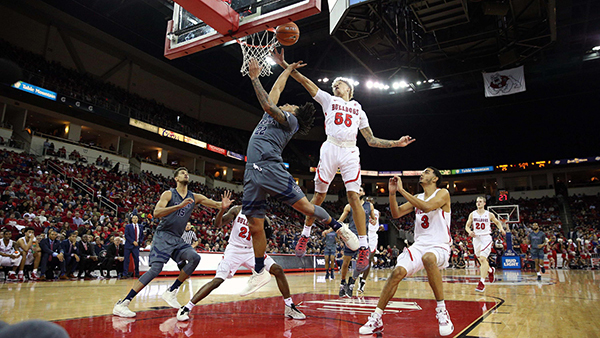 Follow Fresno State Athletics on social media and get into the game FREE. Salute to Sunday - all active military or veterans with valid ID get free admission as a thank you for their service. 2 p.m. Sunday, Feb. 17 - Wrestling vs. Oklahoma. Salute to Services. All active military and veterans get free admission as a thank you for their service.